Dhubri, the historical town of Assam, is ready to welcome the second visit of Assam Governor Prof Jagadish Mukhi, who is arriving here on Wednesday and will remain stay for next three days to take the stock of cleanliness drive of the Dhubri town and civil hospital as well. But dumping of garbage of the town in Mela Maidan ghat is posing threat to river Brahmaputra. Remarkably, the Governor had expressed their dissatisfaction over the overall cleanliness scenario of Dhubri town and marked Dhubri Civil Hospital as the ‘most dirtiest hospital’ of Assam and also directed to improve the dirty image within a month. And, accordingly, the district administration and Dhubri Municipal Board utilised their entire energy in the cleanliness and have carried out eviction drive as well which was underway in and around the Dhubri town in a war footing since the last one week. And finally, the authority has given a beautiful look of Dhubri town, the roads have been totally clean, pavements have also been freed from encroachment and local people are also appreciating the initiatives taken by the district administration on the one hand while on the other hand the people have also reacted over the dumping of garbage at Mela Maidan Ghat and Jogmaya Ghat of town. The Dhubri Municipal Board of Assam established in 1883 comprising 16 wards town is bounded by the might river Brahmaputra. The town has a population of 66224 according to 2011 census. 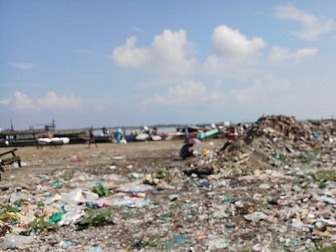 For several years now, the solid wastes collected by the municipal board have been posing a serious threat to the common people as well as the mighty river Brahmaputra as the municipal authority faces acute problems on the issue of proper disposal of MSW (Municipal Solid Waste). And, in the absence of scientific, modern solid waste management, Dhubri Municipal Board dumps the wastes of the entire town at Mela Maidan and Jogmaya ghat of Dhubri town. The Mela Maidan is located just 400 m from the municipal office area and is near the embankment of the Brahmaputra. While Jogmaya Ghat is a place where the State Government celebrated the Namami Brahmaputra Utsav in the first quarter of 2017 and is just located on the bank of river Brahmaputra, adjacent to the Border Security Force (Water Wing) camp. The duo dumping ground abuts the river. This location is totally unscientific as the dumped wastes directly mix with river water very easily, through water runoff process. The condition of the dumping site is very poor. Pramod Roy, a local environmentalist said that this kind of waste pollutes the river water and the continued inaction on the part of the authority concerned affects not only the river water ecosystem but also the water quality of the river. There are more than 1000 families starting from Mela Maidan ghat to New Ghat area of Dhubri town living along the length of the river and mostly of them are dependent on river Brahmaputra for drinking purpose and all other domestic uses. The river continues to remain the lifeline for people living across the ghat but it has turned into a dumping ground, Roy added. But, despite knowing the facts, the Assam Urban Water Supply and Sewerage Board, which is supplies drinking water among the residents of Dhubri town has installed pumps to collect water from river Brahmaputra in front of the residence of the Deputy Commissioner, Dhubri, which is hardly 300 m away from the Mela Maidan dumping ground. Dukhi Ram Das, a 65 years old and a resident of Mela Maidan said that the DMB often resorts to burning of the waste, which ultimately causes air pollution in the surrounding area, with the uncontrolled smoke spreading around, accompanied by a very unpleasant odour. Apart from that, the filthy smell round the clock in the surrounding areas has become another matter of concern for the local residents. But, though a number of social organizations namely Lion Club, Leo Club, Biswa Nabin Sangha as well as Government organsaions namely Nehru Yuva Kendra and Dhubri Municipal Board have launched massive awareness drives on cleanliness in and around the Dhubri town under the banner of ‘Clean Dhubri-Green Dhubri’ they have not raised any question over dumping of garbage near the embankment of the Brahmaputra.